The conventional cars that we drive today don’t really talk to one another. Sure, some of them connect to your cellphones and mp3 players. But they don’t form a communication network with neighbouring cars to figure out whether they should change lanes, slow down, or swerve out of harm’s way. The idea of autonomous cars that can communicate with each other and organize themselves to better control the flow of traffic sounds interesting and possibly scary at the same time. 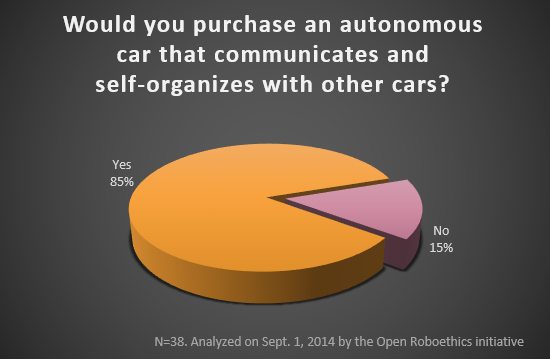 In our latest poll, the Open Roboethics initiative and Robohub wanted to find out whether people are supportive or skeptical of the idea of such network of cars. Results of the poll shows that most people see such cars to save time for them and reduce the number of collisions, because the network of cars will be orderly and able to decrease the chance of you getting stuck in traffic jams. These two reasons echo our findings from the very first poll Open Roboethics initiative and Robohub have published on the topic of autonomous cars in May. When we asked about the main advantages of owning an autonomous car, “reduced number of traffic accidents” and “saving of time that would have otherwise been spent on driving” were the two most popular answers. When asked about the potential harms of such network of autonomous cars, the most popular answer (53%) was that it may lead to invasion of privacy, followed by 45% of participants expressing the concerns that accidents can happen from technical glitches and 39% expressing decrease in safety due to the potential of the cars being hacked or abused. From this result, can we say that more people are worried about negative aspects what may come incorporated into such cars by design (privacy issues and technical glitches) than the possibility of a third party (a hacker) hacking or abusing the system? We are not quite ready to make such statement with the limited data we’ve collected from this poll. But given that hacking a car has recently been reported as being fairly easy, people’s worries about the possibility of autonomous car hacking may change in the future. Overall, though, it seems that people are quite open to the idea of cars that can communicate and self-organize. Only 15% of participants said no to such technology, whereas 85% said yes. This is an optimistic result for a potential technology that may come after we’ve adopted autonomous cars in our everyday lives already. But people’s perception on this may change depending on how well autonomous cars without the communicative, self-organizing feature fares.